Ocean acidification and climate change as a whole are expected to affect phytoplankton distribution. 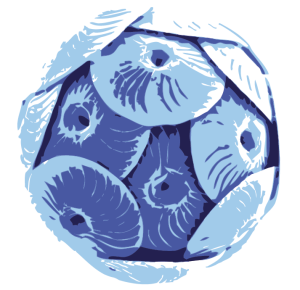 Coccolithophores are the only phytoplankton calcifying group and laboratory studies on E. huxleyi, the most abundant and widely distributed species of coccolithophores worldwide, yield strain-specific results. Culture experiments must be integrated with observations in the natural environment to understand existing interactions between drivers, and to verify population structures in different areas. Our study focused on the Mediterranean Sea, a “natural laboratory” characterized by strong environmental gradients. Two transects spanning the south-western and south-eastern basins have been investigated, combining data from April 2011 (Meteor cruise M84/3) and May 2013 (MedSeA cruise). E. huxleyi coccolith morphometry was analyzed to determine average mass and length. These results were then compared with morphological observations performed on the largely dominant E. huxleyi Type A through scanning electron microscope (SEM). We distinguished four main calcification morphologies within E. huxleyi Type A: low- calcified (A1), medium-calcified (A2), high-calcified with closed central area (A3a), and open central area (A3b). E. huxleyi coccolith mass was strongly and positively correlated with the relative abundance of a particular morphology. Moreover, the calcification morphologies were preferentially distributed in the Mediterranean according to specific combinations of environmental variables, which included the carbonate chemistry system. climate and calcifying phytoplankton. The Mediterranean is a marginal sea; nevertheless our results could be applicable to other regions and reflect ecological mechanisms taking place also in the open ocean.